Not too long ago, I got all warm and fuzzy about The People’s Operator – a new mobile network running over EE’s infrastcrture that gave 25% of its profits to charity and enabled the user to donate a further 10% of their call costs to a cause of their choice. 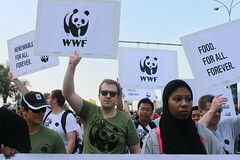 Now it is time to get that glow again ladies and gentleman as the WWF – the World Wildlife Fund, not the pro-wrestlers – has launched its own similar venture. WWF Wildlife Mobile runs as a mobile virtual network (MVN) on Vodafone’s backhaul and offers SIM only services to UK residents. It claims to provide cheaper standard rates than other operators in the UK, but the main point is it donates 10% of the net revenue of all voice calls, text messages and data usage to the WWF. It is early days and as such the only contracts on offer are pay as you go. However, the company sound confident it will bring contracts to the market soon enough and then it is just a case of watching the money roll into the charity. I think these are great and innovativ ways to utilise the large scale infrastcrture with have for mobile operators in the UK but to give something back to the wider world. Two thumbs up from me WWF.